Puss in Boots, hero of the English fairy tale of the same name, is one of ten storybook characters in a boxed set of Jointed Storybook Animals. These articulated paper dolls were created by Bess Bruce Cleaveland (1876-1966), a children’s illustrator whose books, postcards, teaching materials, and educational toys were popular in the 1910s-1930s. The Ideal School Supply Company, an educational materials house who distributed their goods through trade magazines for teachers, printed and sold the Jointed Storybook Animals kit starting in 1929. Cleaveland’s distinctive black-and-white, line-drawn animal puppets influenced the style of other children’s illustrators, and she produced several kits for children to color in and assemble. Other popular do-it-yourself puppet kits drawn by Cleaveland included Birds to Color, Children of Other Nations, Jointed Toys, and Jointed Animals, a set of zoo animals which the company advertised as “not a set of grotesque outlines, but true to nature” when colored in with realistic shades. While perhaps not quite as realistic as the Ideal Company would like us to believe, they were an interesting educational tool. Printed on “good quality cardboard, stiff enough to stand alone,” as they were advertised in promotional materials, each storybook character came as a pre-printed cardboard sheet of shapes – arms, legs, boots, and head, a set of metal tacks, and detailed instructions. Once assembled, they were to be colored in and used to illustrate one of several popular fairy tales – included in the kit were parts for ten characters, from Mother Goose to This Little Pig Went to Market (all of which can be seen in Cooper Hewitt’s collection). Aside from educating children about classic fairy tales, at 35 cents (roughly $4.88 in today’s money) for a set of ten characters, these were a cheap and easily accessible toy which also introduced children to the basic principles of design, construction, and following detailed instructions. Due to the surprisingly high quality of the cardboard used in production, these kits can still be found in antique markets and online – often in excellent condition and unassembled. Gillian Marcus is a paper conservator and a member of the Picturae team working on the mass digitization project of Cooper Hewitt’s collections. 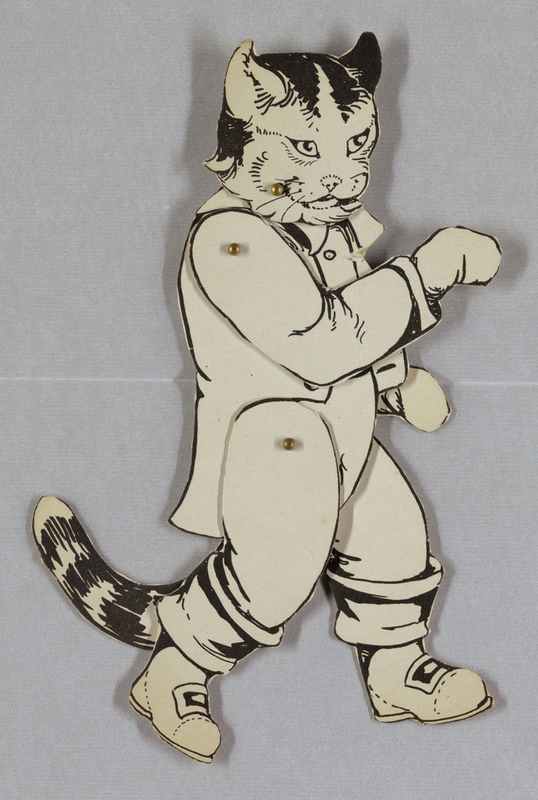 Jointed Storybook Animal, Puss in Boots, 1929. printed cardboard. Gift of Elaine Evans Dee. 1994-19-1.